The U.S. Government, with the collaboration of a disturbingly compliant media, seems to have discovered a deeply rusted version of The Golden Rule: “Do not permit others to do unto you, what you have repeatedly done.” Everybody in the slightest degree attentive to the way world works, knows that espionage and covert meddling in foreign elections has long been a standard weapon in the arsenal of geopolitical diplomacy. The U.S. proudly thwarted the electoral success of Communist Parties in Europe after World War II, not to mention countless interferences large and small, overt and covert, in elections throughout the Global South, with an especially dark record in Latin America (“so far from God, so close to the United States”). Beyond that, if the outcome of democratic elections should produce leaders that pursue policies that disturb Washington such as nationalization of resources, adoption of leftist policies, friendship with U.S. adversaries, more than meddling is likely to follow. Such a government can depend vary degrees of delegitimation, destabilization, sanctions, and eventually even military intervention. The mainstream media in the West has focused relentless outrage on claims of Russian hacking of the American electoral process without even taking note of relevant American practices. The establishment’s most trustworthy public voice of imperial reason, Thomas Friedman, refers to Russian behavior as an ‘act of war.’ The very slippery ex-CIA Deputy Director, Michael Morel, uses even more inflammatory language, describing Russian hacking as ‘the political equivalent of 9/11.’ There are numerous raucous calls for a ‘proportionate response’ by the United States including even such provocative and punitive acts as equipping the Ukraine with offensive weaponry. What is extraordinary, even for those familiar with the geopolitical dimensions of world politics, is for this debate and discourse on alleged Russian hacking to proceed with no questions asked about the thick dossier of comparable American electoral meddling all over the world over the course of decades, including taking much more direct forms via bribery, assassination, and assorted other consequential interferences than anything the Russians have done. When we think further about what has been hacked, the hullabaloo is comedic. Wikileaks is accused only of leaking the awkward disclosures of internal Democratic National Committee documents that revealed embarrassing Democratic staff concerns about the way Hillary Clinton was handling her emails and confirming that the DNC actively worked to undermine the primary prospects of Bernie Sanders. If another Snowden had done the original hacking, it would be treated as another case of whistleblowing with ambiguous consequences. The disclosures would be an admittedly controversial status, especially objections to the intrusions on the privacy, really secrecy, relating to the way political parties manipulate the American electoral process. At the same time the emails allowed citizens to know parts of shabby goings on behind the scenes of party politics. Is this truly an interference with American democracy of a magnitude that warrants dangerously escalating international tensions? 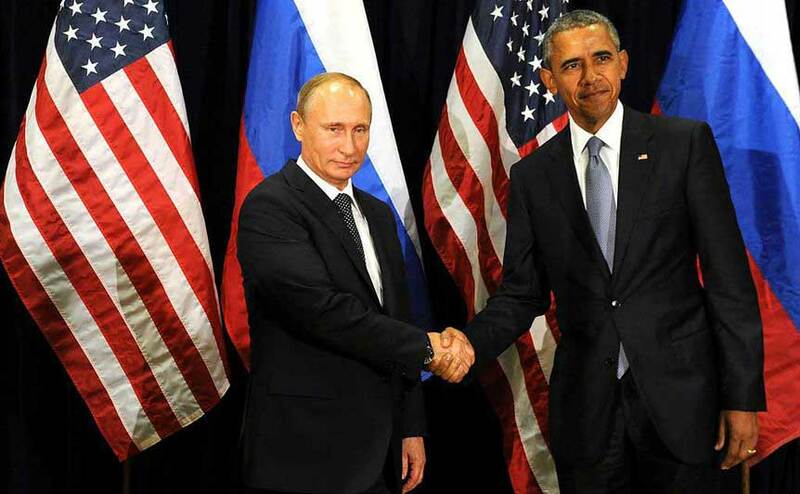 Barack Obama, while reacting with calm language, goes along with these exaggerated reactions, falsely implying by silence an American innocence of undertaking similar to, and often far worse than what the Russians, under Putin’s direction, are alleged (without even some supportive evidence) to have done. The Fourth Law: “The public media is expected to express outrage when the First Law is violated, call for the implementation of the Second Law, while remaining quiet about the presence of double standards and moral hypocrisy. This way of interpreting right and wrong, or the application of law, inverts normal understanding and expectations. What we expect is that all states are either subject to a legal constraint or that it doesn’t exist. We do not expect some to be subject to constraints and one or more others to be entitled to have discretion to act as it wishes, and do so with impunity. Yet international society has long formally and informally allowed power to take precedence over law and the legal ethos of equality. Even the United Nations Charter in establishing the Security Council embedded geopolitics in the formal structure of the world organization by granting the five winners in World War II with permanent membership (P-5) and the right of veto. This combination means effectively that for these five states compliance with international law is completely voluntary and only those decisions that meet the approval of the P-5 become mandatory. Put more vividly, the UN was able to act decisively in Libya (2011) because there was no veto, while in relation to Syria over the course of the last five years there has been no capacity for the UN to act due to the right of veto threatened and exercised by Russia and China. 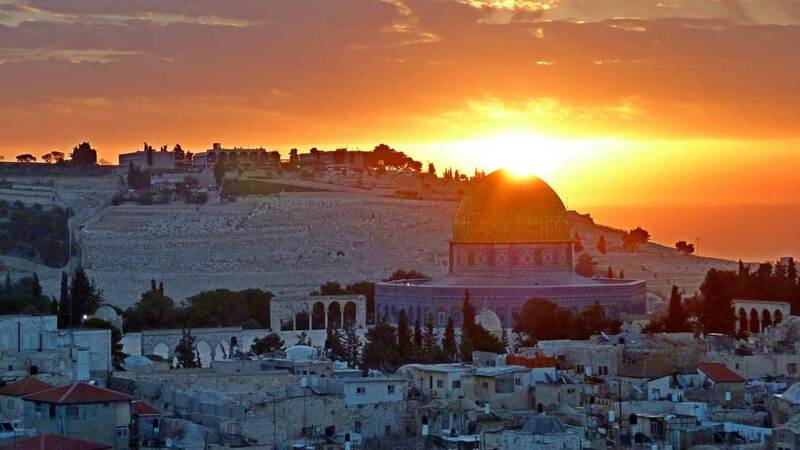 Another example: Israel has been consistently shielded from UN censure by the Security Council over the years due to U.S. reliance on its veto power. The geopolitics of the global state are similarly structured, although less explicitly. Standards of criminal accountability apply effectively only to losers of major wars (Germany, Japan after World War II) or countries in the Global South. The United States has exempted itself from any prospect of accountability except by symbolic actions resulting from civil society initiatives. For instance, during the Iraq War of 2003, there took place a series of legal inquiries conducted under civil society auspices. These culminating in a session of the Iraq War Tribunal in 2005 that reached conclusions through its jury of conscience that the United States and the United Kingdom, and their leaders and collaborators, were guilty of aggressive war and violations of the laws of war. The Western press in the liberal democracies upheld the Fourth Law of Geopolitics by maintaining a steadfast silence about these proceedings, although the Iraq War Tribunal proceedings carefully documented its findings and enjoyed the participation of some of the world’s leading jurists. The nuclear weapons states, as part of the nonproliferation bargain to induce other states to forgo the weaponry, promised back in 1968 to engage in good faith negotiations to achieve nuclear disarmament along the way to demilitarization and general and complete disarmament. Although the International Court of Justice in 1996 unanimously upheld this interpretation of the treaty obligations of the nuclear weapons states, there has been no movement in the direction of compliance. In fact, Barack Obama, awarded the Nobel Peace Prize partly because of his anti-nuclear posture, approved of a $1 trillion dollar modernization and development program for the American nuclear arsenal over the next thirty years and for the eight years of his presidency has never called upon the United States and other nuclear weapons states to implement their clear NPT treaty obligation. The same geopolitical structure is present with respect to ‘humanitarian intervention’ and general standards of compliance across the spectrum of human rights violations, ranging from torture to judicially enforced racism. The West under American leadership operates as if it enjoys a right of intervention, preferably to be exercised with UN backing, and a corollary tacit right to be free from reciprocal claims even to correct its most flagrant human rights abuses. When the George W. Bush presidency overtly relied on and justified interrogation practices widely viewed as torture, there was no call for the implementation of the international legal disallowance of torture and related abuses of human rights. For the United States to renew a reliance on waterboarding is, at best, a matter of policy, while for other countries such practices would be regarded as a matter of law. My friend and colleague, Rich Appelbaum, raises an important point. Granted that this kind of interference has been used a major foreign policy instrument of the United States, what Russia apparently did with respect to hacking and possibly even tilting the election in Trump’s favor is clearly undesirable, and should be treated as unacceptable. Yet even here the context is complex. First of all, to retaliate against Russia without even acknowledging that the U.S. Government has habitually interfered in foreign elections creates a false consciousness among the American people and invites accusations of hypocrisy. There is also a deeper problem associated with security in a state-centric world with a weak UN. If our leaders were confronted by a foreign election in a major state in which one of the candidates was a warmongering extremist and the opponent a moderate, would it not be rational, and in the national, and even the global interest, to do all that could be done to tilt the election away from the extremist. From the Kremlin’s perspective, Hillary Clinton was perceived as hostile and militarist, while Donald Trump was evidently regarded as friendly and supportive of a lower American military profiles, especially in the Middle East. I think these perceptions are faulty overall, but all the evidence suggests that such views are widely believed in Russia and sincere. Regulating the use of cyberspace is decidedly a gray area. International law and the UN Charter give little guidance beyond the vague directive to respect territorial sovereignty. This Russian hacking incident may serve to provide the political impetus for a lawmaking treaty binding all countries to a framework that at least establishes guidelines for governments of sovereign states to follow. Even if such a framework can be agreed upon, a big if, there are many areas of doubt as to what is best considering the present structure of world order. A first question is whether to keep cyberspace as a playground for geopolitics, and a second is whether it is desirable to prohibit all forms of meddling in foreign societies, and their elections and internal politics, no matter how dangerous and malevolent we perceive foreign developments to be. In a globalizing, interdependent, and nuclear armed world it would be playing with species suicide to decree by law, morality, and practice detachment from developments in foreign societies that pose deep threats beyond territorial borders. In the end, perhaps, the best solution is to treat such hacking incidents and related disclosures the same way as espionage. Our spies are heroes, rewarded and honored in various ways; their spies are notorious intruders subject to the harshest punishments that criminal law can impose. Espionage goes on by every conceivable means, including increasingly reliance on the best tools that innovative technology possesses. The ‘game’ played is to defend our ‘secrets’ against foreign spies and domestic whistleblowers by all available means, but to do everything possible to learn their secrets. We can hope for prudence, but little more, in this double game, and maybe this is the way to handle hacking intrusions in our political space: scream about violation of our electoral process, while doing our best to exert control over theirs, but not succumb to the sort of outrage that raises international tensions in dangerous ways. We should take account of the fact that sometimes espionage provides information about adversaries that is reassuring, and discredits domestic hawks calling for dangerously adventurous policies. I am someone who fervently wished, despite strong reservations about Clinton’s foreign policy inclinations and past record, that Clinton had won the election by norms of the electoral college as well as a result of the popular vote. I regret deeply the [alleged] Russian role in hacking the DNC, their failure to disclose the RNC hacks, and deplore their profoundly flawed judgment in believing that they and the world would be better off with a Trump presidency. In conclusion, I have long opposed American interferences in the political life of foreign countries, believe in accepting the outcome of the dynamics of self-determination, and have long thought the United States and the rest of the world would be better off if the government accepted the discipline of international law as setting limits on foreign policy options. In my view, such a realization is the unlearned lesson of the Vietnam War. I would repudiate the four laws of geopolitics, and opt instead for a global leadership role for Washington based on the rule of law. Of course, we should not embrace international law, or any law, with illusions. Law can be twisted in contradictory ways by legal experts. Law often is an instrument of geopolitics. Nevertheless, with eyes wide open, international law, diligently applied in accordance with a culture of human rights and peacemindedness, is a better guide for the national and global future than geopolitics. This article was originally published at RichardFalk.Wordpress.com. 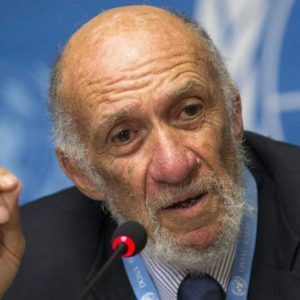 Richard Falk is an international law and international relations scholar who taught at Princeton University for forty years. Since 2002 he has lived in Santa Barbara, California, and taught at the local campus of the University of California in Global and International Studies and since 2005 chaired the Board of the Nuclear Age Peace Foundation. From 2008 until May 2014, he was the U.N. Special Rapporteur on the situation of human rights in the Palestinian territories occupied since 1967.